Please do not hesitate to contact any of us. London’s membership is diversified with representatives from most 33 boroughs, national organisations and associations; and from architects, planners and other professionals of the buildings industry. This diversity is very important to our membership. It gives us the opportunity to share and develop our knowledge by having meaningful debates, presentations and discussions. In addition to a regular newsletter, we have set-up a Yahoo group e-mail to communicate efficiently between members. With our members continuous professional development in mind, we organise various events, visits, talks and a yearly conference. Your input to any of those is encouraged, so please do not hesitate to contact any of the committee members to discuss your suggestions. Finally, if you are interested in becoming a member and would like to discuss the entry requirements informally, please contact us. Join us for an evening of talks on the survey and preservation of historic plaster ceilings. We will start with a presentation by Richard Ireland on the stylistic development of plaster ceilings together with an overview of their investigation, defects and repair. This will be followed by Kevin Clark from the heritage team at Conisbee Consulting Engineers who will talk about some of their recent work accessing, inspecting and appraising the structure that supports such ceilings, often in highly challenging conditions. Richard Ireland is the UK's leading conservator of historic plaster and paint. He operates principally as an independent consultant and practitioner but also advises for public bodies. Richard's projects typically involve a combination of archaeological investigation, scientific analysis, and contextual historic research. Conisbee is an award winning civil and structural engineering design practice with offices in London, Norwich and Cambridge with a specialism in heritage engineering and CARE registered engineers. Together, these two talks will provide us with an understanding of the methodologies applied to care for these important architectural features. Join us for this not to be missed opportunity to hear from Christa Masters of HM Planning Inspectorate, David McDonald of IHBC & Henrietta Billings of SAVE. David McDonald, IHBC President will introduce plans to review the IHBC's governance. Since its inception over twenty years ago, the Institute's constitution has not been changed. It has been recognised that it has some inherent weaknesses with regards to a number of issues including the requirements of the Charities Commission, the ability to act internationally and possible working towards chartership status. This will be an opportunity for London Members to hear more about governance and comment on how the IHBC can take it forward into the future. Henrietta Billings, Director of SAVE Britain's Heritage will talk about the organisation's work and campaigns with particular reference to its role in appeals. Join us at the splendid Black Friar, a Grade II* listed building, built in 1875 on the site of a former Dominican friary. Remodeled in 1905 and 1917 by the architect Herbert Fuller-Clark. Much of the internal decoration was done by the sculptors Frederick T Callcott and Henry Poole. The building was nearly demolished in the 1960s, until it was saved by a campaign spearheaded by poet Sir John Betjeman. 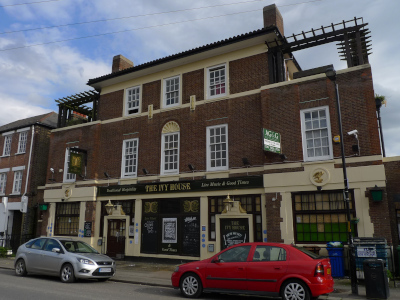 It is on CAMRA’s National Inventory of Historic Pub Interiors. NOTE: On the day, all branch members will receive a red envelope containing a £5 contribution towards your first drink. NO NEED TO BOOK FOR DRINKS, JUST TURN UP. We are holding another Membership Application Training Event (from 6.00 – 8.30 pm) the main aim of which is to assist people in upgrading their membership from either Affiliate/Associate to Full membership. Join us for a return visit to Turners House, to see the now completed HLF supported restoration project and worthy winner of the RIBA London Conservation Project of the Year 2018. The tour will be led by Gary Butler of Butler Hegarty Architects. Built by 1813 to the designs of England’s great landscape painter, J.M.W. Turner, working here as his own architect to create a quiet retreat for himself. The Turner’s House Trust was set up in 2005 and with Butler and Hegarty architects has led a fascinating project to restore the house to its original appearance, open it to visitors, display the Livermore Collection of Turner material, and set up a programme of activities and learning opportunities. Join us at HS1 offices which enjoy good views over this part of north London and hear from members of Conisbee’s heritage team on some of their recent work appraising historic plaster ceilings, surveying industrial gasholders and examining the fabric of a unique country house. Conisbee is an award winning civil and structural engineering design practice with offices in London, Norwich and Cambridge. Conisbee has a specialism in heritage engineering with engineers who are CARE registered. All members attending the AGM will receive a free glass of wine. Amid changing legislation and strategies, how do we combat the threats of demolition and permitted development, particularly in relation to the forthcoming revised London Plan? The seminar will be of particular interest to those concerned over the protection of London’s historic environment and those involved in delivering conservation and protection outcomes. Join the London Branch for a tour of PERCY HOUSE. This Grade II* listed building with F3 architects. Percy House is a mid C18th house with late C17th forecourt walls and railings. The HLF awarded the Tottenham Hotspur Foundation a grant for the restoration of Percy House to provide an employment, enterprise and skills hub. These works form part of the wider regeneration of the area. Branch Members were on IHBC duty on a stand at the Listed Property Show at Olympia on 19-20 February, a free event which was billed as being designed to 'banish owners' domestic nightmares and ensure another 12 months of healthy home-ownership'. We were among window and door manufacturers, specialist craftsmen and adjacent to Charles Brooking's architectural salvage collection. We had a wide variety of queries from property owners, potential IHBC members and other exhibitors keen to advertise in our publications. We were pleased to take the opportunity to raise the Institute's profile and we actively encouraged a diverse range of people to apply for membership. 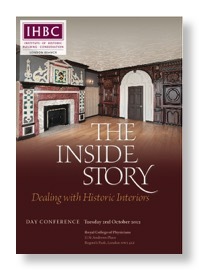 - Danson House, visit with Richare Lee of English Heritage followed by a visit to the Red House, Bexley Heath. The COG meetings are typically held three times a year and are open to all local authority conservation officers. The boroughs take it in turns to play host, with Historic England co-ordinating. At each meeting the hosting borough’s conservation officers present their high-profile, controversial or other projects of interest, and there are typically other presentations on aspects of policy, practical topics or issues affecting conservation of the historic environment in London. The meetings typically conclude with a visit, for example a recent meeting at Haringey held at Alexandra Palace finished with a tour around the areas of the Palace affected by the recent conservation and redevelopment works, including those areas altered during the 1930s by the BBC. The co-ordinator for the meetings is Rachael MacMillan, who can be contacted at Rachael.Mcmillan@HistoricEngland.org.uk. 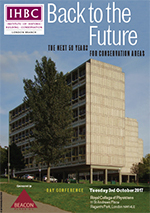 It is claimed in some quarters that the conservation battle has been won. Exemplary developments such as those at Kings Cross show how a conservation-led approach can bring both private and public benefits. But this is no reason to sit on our heritage laurels. There are still many who are sceptical about the value of the historic built environment. Our challenges range from continuing austerity, the disposal of public assets to the pressure for more housing. How are we adapting and changing to meet these challenges, and what creative means are there to keep our profession at the forefront of protection of the historic environment? 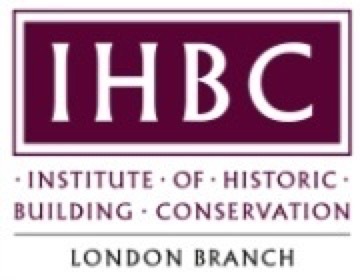 In this, the fourteenth of IHBC's London Conferences, we will be looking at how national organisations such as Historic England and the National Trust are modernising their agendas; how funding bodies are responding to needs in the third sector and how we can do more to promote the sector. A series of case studies will include how imaginative architectural solutions can increase density while protecting heritage assets, together with innovative ways of re-using Assets of Community Value. 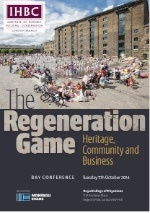 This conference will be of relevance to conservation officers and other heritage professionals, town planners, urban designers, engineers, surveyors, architects and archaeologists, and as usual we intend the presentations to bear of nationwide interest, not solely London-focused. The London Branch committee has organised very successful conferences over the last few years. If you wish to contribute any information to the newsletter, please contact our editor, Marc Timlin on 020 7312 7404.